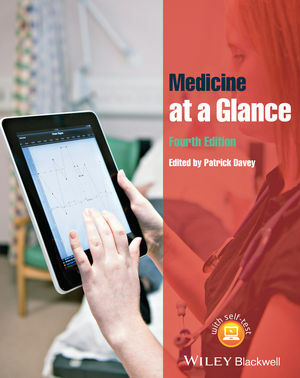 This fourth edition of Medicine at a Glance, the leading title in the best-selling at a Glance series, provides an unparalleled overview of the study of medicine, closely following the core medical curriculum. Ideal for medical students, Foundation programme doctors and those training in the allied health professions, Medicine at a Glance presents vital information on clinical presentations, diseases, and treatments in every major medical specialty, from cardiology to dermatology. • Has been fully revised to reflect essential clinical and curriculum updates. • Contains brand new material in key areas such as imaging, women’s health, communication and data interpretation. • Features a brand new, clearer text design, in the trusted at a Glance double-page spread style, in full-colour throughout. • Is the ideal, practical companion to clinical attachments, available in a range of digital formats for on-the-go study and revision.